Indrani Rathnasekera’s book on ‘Pablo Neruda ‘ (1904-1973) - a Chilean by birth, but graciously included among the world famous Spanish poets who had been crowned in glory for his contribution to Spanish literature due to his skills in prose and poetry - is the latest of her series of books dealing with Spanish poets who stand among others as the greatest contributors to world literature. 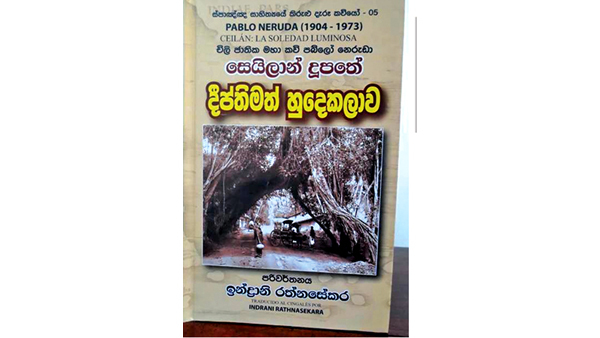 The book has special reference to Sri Lanka as the title of book indicates “Seilan Doopathe Deepthimath Hudakalaawa (En Ceilan La Soledad Luminosa [Spanish] - Luminous Solitude / Luminescent Solitary in the island of Ceylon). Neruda was a Chilean poet of world fame, the most important Latin American poet, the winner of Nobel Prize for Literature (1971) a diplomat, a Member of the Senate, and an active politician of his time said to have died of cancer on September, 23, 1973. He is among the Nobel Prize winning historical figures including Paul Claudel of France, Ivo Andric of Yugoslavia, and Octavio Paz of Mexico. Though a Chilean by birth, Neruda loved very much the Spanish language and used that language to express his feelings, his life, joy and sorrow. Pablo Neruda had served as a Consul in Sri Lanka for Chile, the country of his birth from 1928 to 1930 and this volume deals basically on his poetic geniuses. He had come once again on a ‘peace mission’ to the country during the years 1952 – 1957. He had also served as a diplomat in Yangon (Rangoon), Mianmar (Burma) ; Java islands, Spain, France and Mexico. The work of Indrani is not a mere translation of selected work, prose and poems, directly from Spanish language to Sinhala, but an invitation and at the same time an opening for those eager to learn more about Spain and her literary giants of yesteryear. It brings out the soul of a man who loved Sri Lanka, her environmental beauty, fishermen and the sea, who knew nothing of those, when he was posted to then Ceylon to represent and serve his country of birth as Consul. There is a 40 page long separate chapter giving an account of his much cherished past memories of then Ceylon and speaks of how he moved among the people visiting and bathing in the sea, close to his temporary residence at Wellawatte to the Galle in the Southern Province. It is a sort of an autobiography written in prose but also includes poetic expressions of his attachment to Sri Lankan soil and her people. driver, named his son Neftali Ricardo Reyes Basoalto, and Neftali bsequently took the name Pablo Neruda, as his father and step-mother (Pablo’s mother Rosa Basoalto, had died, when he was just two months old) were not in favour of his choosing the literary field. He was also compelled to change his name as he himself had said that his name was too long like a moving train. He coined his name by taking ‘Pablo’ from a famous French poet Poul Verline and ‘Neruda’ from the name of Jan Neruda , a Czechoslovakian poet. Neruda at the age of 10 had earned a name for himself as a poet with the publication of his poem in a Magazine in Santiago. He often had used green ink claimed to be his personal symbol of desire and hope. He had found words of encouragement from his school teacher Gabriela who referred to him as ‘here is a real poet’. He as a poet did not remain sticking to one style of writing but varied. Thus perusing his work, one finds that he had written surrealist poems, historical epics, political manifestoes, being politician, an autobiography in prose, fascinating poems of passionate love among his collections. Indrani has chosen some of the best out of them to include in her present work. The book consists of three main chapters, dealing with life of Neruda, his literary work –selected poems, his stay in Sri Lanka, and his love for Spain and an interview he had given in 1970, to Rita Guibert, a journalist. Indrani, winner of several awards and state honours for her work, presents to the enthusiastic reader with most important information of life, work, and times of Neruda. She not only refers to his work, his outstanding ability in composing poems to capture the hearts and minds of his readers, but also brings out to the open, his very personal love life ,which Neruda himself had exposed, by composing poems giving expressions to his loving three wives who joined him in his life journey at intervals. While his first publication came out in 1923, the second was “Twenty Poems of Love”, (Veinte Poemas de Amor) published in 1924, was dedicated to Albertina Rosa Azocar, his first love. He could not marry her due to the opposition of her parents.” One Hundred Poems “( Cien Sonetos de Amor 1959) was sent to his third wife Matildae who lived with him until his death. Those two publications stand out as unparalleled contributions to world literature. Indrani, who was conferred with the honourary title “Civil Order of Merit” by the Government of Spain, in recognizing her work to bring Spain closer to Sri Lankan readers, has taken pain to do a bit of investigative journalism, digging out to give the best to the Sinhala reader to read and assimilate the work of outstanding world figures who had heavily contributed the literary world. Thus her present work is undoubtedly a praiseworthy effort in enhancing and enriching the scope of the Sinhala literary spectrum by adding world famed literary work. Indrani, a versatile writer had obtained her Diploma in the Spanish language from Complu tense University in Madrid, was a former employee of the Sri Lanka National Airways. The book (second Edition) is dedicated to Prof. Sunil Ariyarathne and late Dr. Tissa Abeysekera. It is a publication by Fast Publishing (Pvt) Limited, Colombo 10. Mahattaya’, a novel by Ashoka Piyaratne, based on the life experiences of senior journalist Seelaratne Senarath, will be launched today at 2pm at the Mahaweli Auditorium, Colombo. The novel is based on the life lessons acquired by him and also imparted on his students while serving as the headmaster in a remote school in Sippimaduwa, Batticaloa.